I almost resolved to update my blog more in 2012, but I took the easy route and bought a gym membership instead. Since last update – played in the NMC Ann Southam concert, did some outreach work with the amazing Julia Aplin at the Sweetwater Festival, played the penultimate concert in our Haydn Piano Trio Cycle (last concert is April 1st here), conducted and played in the John Cage show for Nuit Blanche Toronto, conducted Michael Gordon’s Trance with CONTACT at the Music Gallery’s X-Avant Festival, recreated Carole King’s Tapestry for the Global TV Cabaret Festival, music directed the revival of John Beckwith and James Reaney’s Crazy to Kill for Toronto Masque Theatre, did some reading and performing in the Young Centre’s Word Festival, Vinko Globokar came to town, did some work with the always fun Young Centre City Choir, which anyone can join and is free!. Coming up soon – on January 29th, I’m playing in Thomas Kessler’s Piano Quintet – an hommage to Mozart’s, as well as the premiere of Omar Daniel’s new piece Mehetapja for three sopranos and ensemble, part of the New Music Concerts Legends show. Details here. On February 25th, I’ll be in Vancouver playing some four piano stuff with the Vancouver Bach Choir and some amazing klavierspielers – the Elizabeth and Marcel Bergmann and Kinza Tyrell. Stravinsky’s Les Noces and Carl Orff’s Catulli Carmina. Should be amazing. 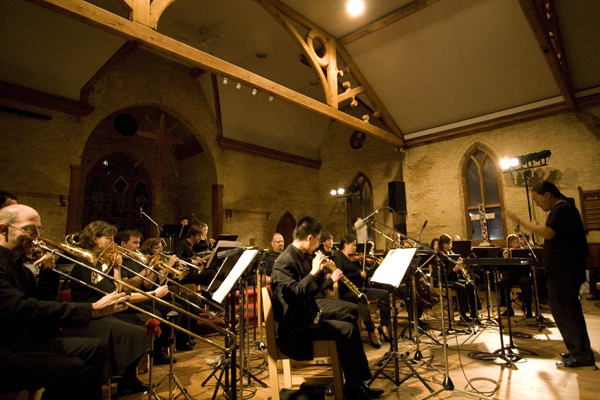 In March, I’ll be playing with the Toronto Symphony Orchestra for the New Creations Festival. Looking forward to working with Peter Eotvos. I also wrote an article about the festival for the TSO magazine. You can read it here. You are currently viewing the archives for January, 2012 at Gregory Oh.